Woodside Energy redesigned its ‘artificial intelligence for everyone’ virtual assistant Willow after the first version fell short of lofty executive promises and heightened user expectations. The Australian liquefied natural gas (LNG) producer last month provided its first major look at Willow in more than two years. Willow was first unveiled as a concept back in October 2016. 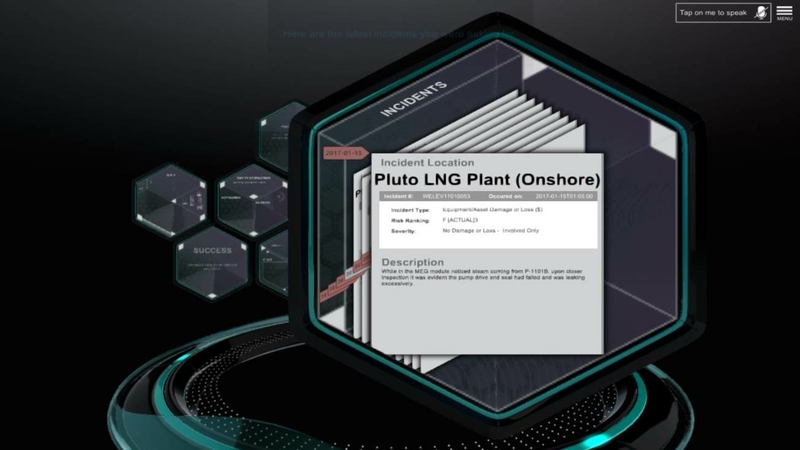 Sporting a 3D user interface, it was described as a “virtual avatar” that could poll Woodside’s IT systems to find answers to questions posed either via voice or text. A year later, Willow was deemed production-ready, albeit with a “simple chat interface” instead of the 3D model that had been shown as an early proof-of-concept. At IBM THINK 2019 in San Francisco last month, it became clear why Willow’s appearance had drastically changed between development and launch. “The very first version of Willow that we worked on looked a lot different [to what it does today],” head of AI James Baxter said. “In the beginning [of the Willow project], we wanted to test two real things. Could we converse with a system through natural language, and secondly, could we reimagine the way that you interact with a system? Willow as it was originally conceived in Unity. Baxter said that Woodside’s data science team “learned two valuable things” out of its early Willow work. “First, Unity wasn't a great thing to integrate back to your enterprise applications - the API connectivity and the rest of it wasn't too easy,” he said. “The interface also didn't really work for users, though it's probably more how we implemented it, as opposed to [anything about Unity in] general. With the natural language side of Willow - based on several IBM Watson components including Assistant, Natural Language Understanding, and Discovery Service - deemed to work, the challenge turned to finding a way to recreate the front-facing user experience. “We ditched the Unity interface and simplified everything back to a chatbot,” Baxter said. The “simple chat interface” lasted 12 months, but came with a series of downsides. One of the main ones was that it didn’t represent the vision or promise of Willow that had been sold to the business, or had been apparent when Willow was first unveiled as a concept back in late 2016. “The Willow journey started with high level executives pumping up the benefits of AI and how it learns everything going forward,” Baxter said. Additionally, the longer the chatbot stayed, the more it boxed the project in. “The interface was limited. We couldn't do a great deal with a chatbot style-interface and also people kept calling it a chatbot,” Baxter said. There were also some teething problems with the implementation, in terms of what it was designed to do versus what it had been sold internally as being capable of. “We weren’t building a general AI but that's what our executives sold,” Baxter said. One way that the data science team re-engaged Woodside’s business users around what Willow could do was to create a simple demonstration experience. Given every employee at some point would need to book leave of some sort, an experience was created where Willow collects a handful of details via voice or text, automatically generates a completed leave form, and then provides single-click submission into the company’s SAP system. 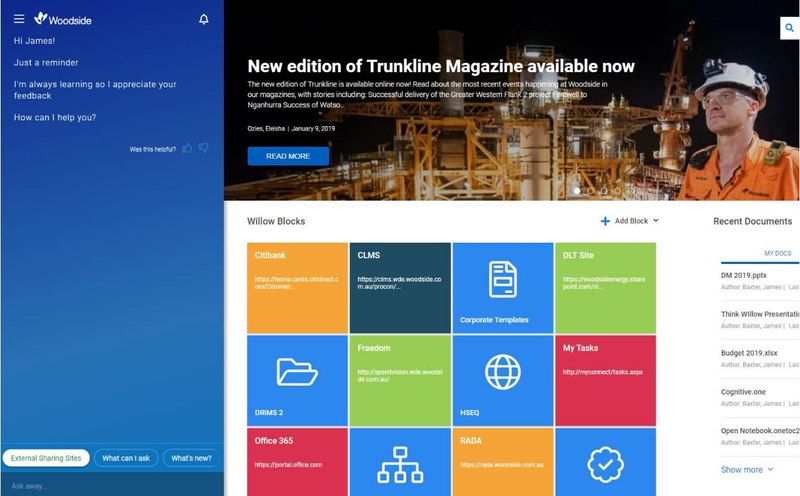 “It’s not exactly rocket science to go and build a little workflow to book leave and chuck it into SAP, but what it did was it inspired the users to think about their processes and their systems that might be a lot more complex, and how they can simplify them through either a bit of natural language, or just a creative UI and some nice design thinking around what it is they were trying to achieve,” Baxter said. 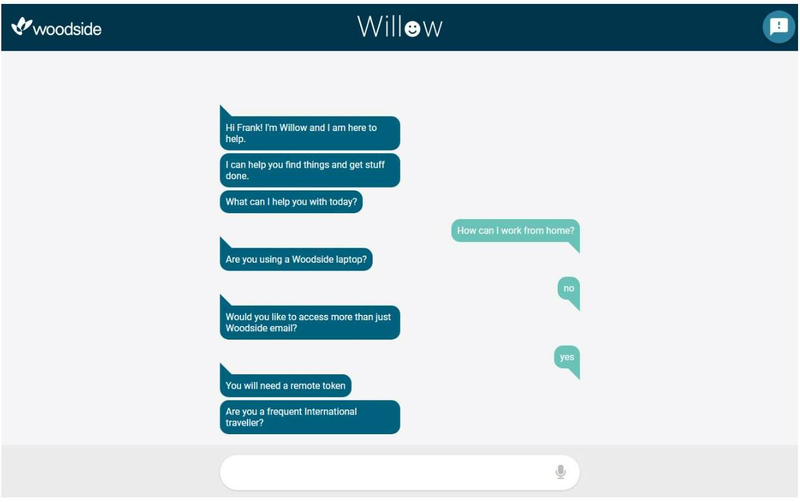 Woodside also evolved the look-and-feel of Willow from a simple chatbot to “fully integrated web application” with a tiled interface. Willow as it now appears to all users at Woodside. “It gives us a lot more real estate to work with,” Baxter said. Baxter said this signalled a change in strategy for the ongoing evolution of Willow. “We've started to change from trying to push everything through a chat, to how do we build applications that just have natural language [as a native capability],” he said. “We're seeing internally more of an evolution towards that. Willow has also been augmented to provide users with transparency on how the machine came to answers that it did - to foster trust in the technology. “A lot of our company is built around engineers, who are very smart but also very skeptical. They like to understand 'why are you doing this' or 'why you recommending this to me' so we want to build transparency into the recommendations that we present to them,” Baxter said. In addition, Willow contains a LinkedIn-like endorsement system that can be used to add trust. “If I ask Willow who knows about chemistry in Woodside, I want to know why the machine is telling me [an employee called] Chris knows about chemistry,” Baxter said. Willow remains a voluntary - rather than mandated system of record - within Woodside. “People use it because they want to use it,” Baxter said. But the technology is still expected to meet one of its key aims in lowering costs of future massive LNG projects by learning from those undertaken in the past. “We're about to embark on a couple of very large new capital projects,” Baxter said, alluding to its new Scarborough project as well as other expansion projects also in the pipeline. “We need to be more productive with our time and utilise our time better. “If we can find the information, the history and the lessons from prior projects and work that we've done, we can spend more time on those growth projects." Ry Crozier attended IBM THINK 2019 in San Francisco as a guest of IBM.